A: For each of my novels I have allowed myself the luxury of years of research into a subject or two about which I could not make up my mind or wanted to investigate with a totally open mind. Q: What was your inspiration for writing ROXIE & FRED? 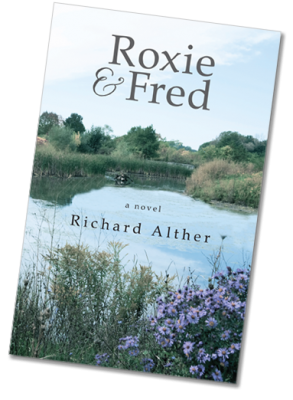 A: ROXIE & FRED allowed me to explore two things: the psychology of creativity (they are both artists), and the process of death from the points of view of the dying and the surviving partner. Q: Has your own life been the spawning grounds here? A: With this, my fourth novel, I found I’d exhausted most shreds of my personal life back story for inspiration in delving into the particular subject of compelling interest for me. For example, Siegfried Follies is a Holocaust story from the perspective of a non-Jew. I was raised in an unapologetic anti-Semitic family and community, which I wanted to come to terms with as an adult. I have not dealt with a spouse’s death, but I have been a life-long painter. Q: What was different for you writing your fourth novel? A: With each of my earlier works I outlined in detail every chapter and wrote it, re-writing several times before proceeding. Not so with ROXIE & FRED. I knew where I wanted to begin their story, and where it ended, but was completely led by my characters throughout their journey. For the first time I just started writing Chapter One and didn’t stop until my first draft was complete, over a year later. This experience was thrilling. Q: How did you come to create your heroine as an extremely old woman? A: Yes Roxie is inordinately older than her friend, eventual lover, Fred. “Age doesn’t matter,” came to me when I began competing as a swimmer and witnessed men and women up to 100 years old, who may have looked it, facially, but from the necks down defied the norm. This is true for yoga as well, which I practice now 4 times a week. “Use it or lose it.” Roxie is an accomplished yoga practitioner. She hikes mountainsides. She grows her own food as well as meditates. Personally, I have more energy now than I did in my 20s and 30s. And frankly I’m in such good shape “that my loved ones hate me.” They also claim I eat twice what they do, adding fuel to that fire. A: I grew up with feminists and certainly consider myself one. And so: why should just men claim trophy wives? Picasso going at it in his 90s? What about women? And not “cougars” on the prowl, but older women absolutely vital and active in all aspects of life? Roxie and Fred became for me exemplars of stretching the mind and spirit and body to their fullest, sexual pleasure included. Q: A man writing from a woman’s point-of-view is one thing. But sexuality…and at a very advanced age? A: I’m not an expert on older women’s sexuality (despite having researched it extensively). I do feel I’m well-practiced at this point in stretching the imagination. That said, I did have an intimate relationship with a woman many years ago that was senior to me (she wouldn’t tell me her age!) as well as young-man fantasies and worship of certain glamorous women a generation above mine. Q: Roxie and Fred are both artists. Is this their primary connection? A: No, art is how they meet and soon overlap. But art triggers their friendship and dissolves their age difference. Together they attempt to get a handle on what motivates them, and artists in general. They talk seriously but mostly have fun. A: One recent and brilliant novel was captivating: The Life Writer by David Constantine which tracks a widow unravelling the depths of her husband’s early and passionate love for another woman, clearly more enthralling than for him with herself. In general I’ve been a fan of John Updike for his unvarnished view of relationships from the masculine slant. And everything that Doris Lessing ever wrote, beginning with The Golden Notebook, because her of fearlessness, beholden only to her own visions. I should add that in being a friend of Doris’s for 30 years she became a true mentor, critical and encouraging. Q: Tell us about your background in business. A: I did not get an MBA but I knew instinctively as an entrepreneur to listen to my employees, customers, vendors and to treat them as I would family. This resulted in my starting a company in Vermont from scratch and winding up with 300 employees. Yes, I did write mail order advertising copy as a skilled wordsmith that included no malarkey, selling outdoor power equipment up to $3,000 nationwide sight unseen through the integrity of words. But it all happened with the mindset of a novelist placing myself as a medium rather than as the focal point. Q: And you’ve been a professional artist as well? A: I lived in Vermont, not Manhattan, where there is elbow room to become a generalist. A gallery dealer once said my paintings “slid down easily.” Whether watercolors or oils, at galleries from London to Vermont to California, my landscapes and waterscapes are barely defined, very impressionistic, which I came to realize was a way to express my world view before writing fiction. It’s a view that places healing, calming, restorative nature above the flak of modern life. This spirit is very much at the soul of ROXIE & FRED. Q: What is your vision as a writer? A: To ask questions and not necessarily seek answers. Fiction, as opposed to non-fiction, has meant for me to wonder and eavesdrop, not to espouse a hard line…to peel endless layers of the onion in pursuit of discovery, wisdom, tolerance of all points of view, compassion. Q: What’s the single thing you hope a reader would take from ROXIE & FRED?